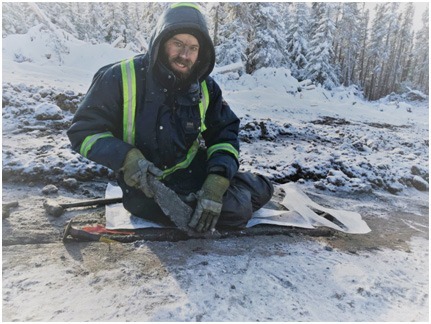 Vancouver-based Berkwood Resources (TSX-V: BKR, FSE: BK2, WKN: A110N3) reported positive assay results from its Phase 4 drilling program completed in December, 2018. Results from their Lac Gueret South deposit in Quebec have shown continued high grade graphite assays with 22.22% Cgr over 102.45m and 43m in surface outcrop channel graphite sample assaying 24.17%. Located in Cote Nord, eastern Quebec, Lac Gueret South comprises 288 claims, which cover a total area of 15,552 hectares. The program was designed to test areas around the western fold nose of Zone 1, and to extend and infill areas of known mineralization with a view to expanding and improving the existing geological model and to prepare for an initial mineral resource estimate. The 16 inclined NQ holes totalled 2,078.3 m at the end of the program. Samples were shipped to MS Analytical Laboratories (Langley, BC) for analysis, following the protocols applied to assay samples for Phases 1 through 3 from late 2017 through 2018. During the program several shallow subcrops of highly graphitic bedrock were exposed and channel sampled. A channel sample composite over 43m taken normal to strike returned an average grade of 24.17% graphite. Of the 16 holes drilled, 13 intersected significant mineralization with one hole having 22.22% Cgr over 102.45m, with a high sample grade of 33.88%. The intersection of multiple wide intercepts (for example the BK1-15-17 intercept of 72.10m at 13.64% Cgr from Phase 1 drilling, among others) continue to encourage the Berkwood team to advance the Lac Guéret South project as rapidly as possible. You can find out more about Berkwood Resources on their website , follow them on Twitter @BerkwoodBKR and connect with them on Facebook and LinkedIn.